Creatine Hair Loss - Does Creatine Cause Hair Loss? Here Are The Facts! When it comes to male pattern baldness and its relation to creatine hair loss, many people have more questions than answers. There are several theories and hypothesis that barely provide clear understanding of this human generic hair loss. For the people who have been in the bodybuilding industry, you could have come across creatine supplement; and heard about its incredible benefits most importantly the muscle gain benefit. 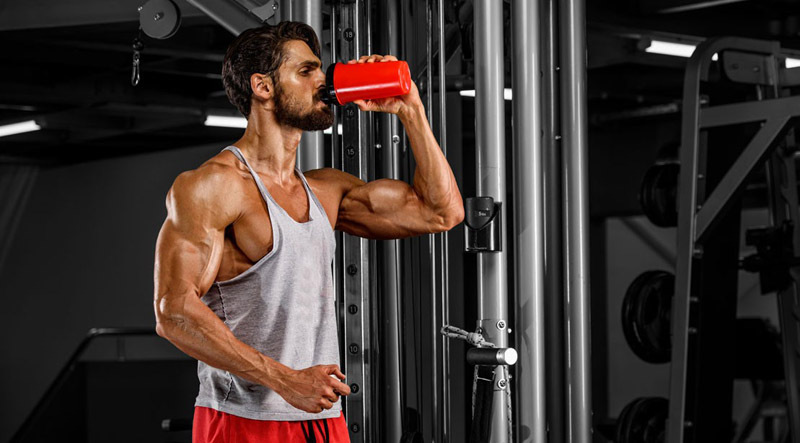 However, many bodybuilders and athletes using such types of supplements are now wondering if the creatine may have any connection to hair loss. If you search online, you will come across different opinions regarding creatine and its relationship to hair loss. You will also find massive bioscience about the same subject. It is therefore essential to look at some of the facts to be able to find out the truth about creatine and hair loss. How Does Creatine Affect The Human Body? Can You Limit Hair Loss Due To the Use of Creatine? For one thing, creatine is known to be an organic acid which appears naturally within a human body. Specifically, the primary purpose of creatine lies in the facilitation of recycling of adenosine triphosphate. Adenosine is the energy currency muscle cells along with the ones located in the brain tissue. Hence, creatine is known to play a very significant role in the act of increasing your energy through optimizing muscle performance. Also, creatine boosts endurance through the actual physical exercise. Unfortunately, the natural creatine stores are known to be minimal. Hence, some creatine supplement was manufactured to stimulate the muscle building and in the protein synthesis rate. Furthermore, the creatine supplement has proved to have enormous impacts such as the act of pulling water into the muscle energy hence providing your body with the desired power during high intensity workouts. Notably, creatine is among the most popular supplement known by athletes who have weight gain goals. And it is almost similar to the other protein compounds and can create phosphocreatine. Likewise, the phosphocreatine then draws some high energy phosphate molecules into the muscles. Several studies on people who take creatine show that the substance could as well raise the dihydrotestosterone levels, improve memory and lower the cholesterol levels. As such, many body builders like this supplement because it help them can maximize their strength in weightlifting. The creatine hair loss is commonly the male pattern baldness. For you to understand the link between the supplement and male hair loss, it is essential to know the cause of male baldness first. Male baldness can be defined as a condition affecting over 70% of men; thus later resulting in loss of hair in the head. That mostly happens when the androgenic hormones block the follicles. Androgenic hormones are hormones responsible for the control of male sexual characteristics such as the DHT. The hormones surround the hair follicle hence preventing nutrient absorption required for hair growth. Over some time the follicle shrinks. The hair then starts to grow thin and later break off easily. After some time the hair stops growing uniformly. However, it should be noted that male pattern baldness is a renowned genetic condition which is inherited from specific androgen receptors. Anyone who uses creatine could have heard the anecdotal evidence that the supplement can cause creatine hair loss. Some people have said that after some months’ usage of creatine, they start noticing a significant hair reduction. Many people know that the increase in DHT levels causes the hair loss. A significant amount of androgenic hormones absorbed in the human body leads to a progressive male pattern hair loss. Therefore, it would be right to conclude that creatine could cause hair loss through its increase in the DHT levels. Some people say that they experience their hair loss in their mid-twenties. However, this is the time when the hair of many people starts to thin. DHT levels always increase whenever you work out even when you don’t take the creatine supplements. Up to date, there are no scientific researches which have been done on the impacts of creatine on hair loss. However, many medical researchers have been able to support the idea of creatine leading to hair loss. For instance, a study done in 2009 on some rugby players showed that after the intake of the creatine, testosterone levels always remain constant but the levels of DHT increased by over 15%. Till date, there are no other studies that have shown such significant levels of DHT levels. However, other several studies have been conducted resulting to a minimum of 15% of testosterone and DHT levels on people who use creatine while working out. Several years of research show that DHT would cause a fast-rate growth of baldness. Hence creatine can be proved to be linked to the increase of male pattern baldness. Some people are just fine with the loss of their hair in order to gain weight at the gym. However, it is imperative to keep that fantastic hair of yours while still boosting your workout. Besides, if you do not have any genetic history, the male pattern baldness may not affect you in any way. For those experiencing these changes, be sure that creatine can cause a drastic hair loss if you do not take some precautions. If you believe that your family is genetically susceptible to hair loss then its only wise that you use the minimal amount of creatine supplement if you most. In conclusion, there are many other supplements which may boost your regular workout without any effects. However, this does not necessarily mean that you can’t use creatine to boost your workout. You can also get several medications from your local pharmacy which are designed to help prevent hair loss when you use creatine.